“Endangered” species are in danger of becoming extinct throughout all or the majority of its range while a “threatened” species is one that is likely to become endangered in the near future. Each species must be listed on the Federal list of endangered and threatened species before it can receive protection under the Endangered Species Act. The ESA was enacted in 1973 to conserve and set up recovery plans for listed species and associated habitats. Numerous threatened and endangered species depend upon the habitats of the Florida Keys. 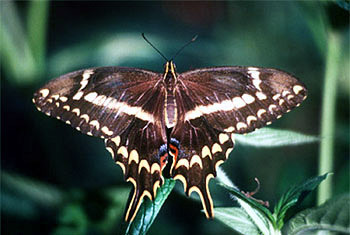 Currently ranging from Biscayne National Park to Key Largo and Lower Matecumbe Key, the Schaus Swallowtail Butterfly is dwindling with populations numbering less than 1,000 individuals. The primary reason for decline is loss of habitat, use of insecticides, collection of the larvae, and extreme weather conditions. Recovery efforts for this endangered species includes captive breeding programs to help restore the population. Habitat use by the endangered key deer (Odocoileus virginianus clavium) includes pinelands, hardwood hammocks, and mangrove swamps. Pinelands, hardwood hammocks and other upland dry areas are utilized for feeding activities while mangrove swamps are used for shelter from the heat during the day. 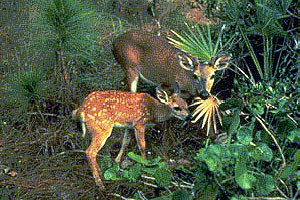 Two-thirds of the key deer population inhabits Big Pine Key and No Name Key. The remaining deer reside in the following keys: Lower Keys: Big Pine, Big Torch, Cudjoe, Howe, Little Pine, Little Torch, Middle Torch, Sugarloaf, and Summerland. Keys located further south lack a permanent supply of freshwater required by key deer for survival. The current key deer population is estimated at around 300, up from the 1955 estimate of 25-80. 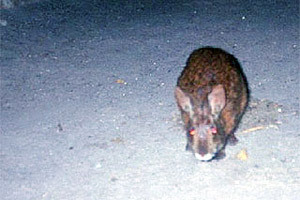 The lower keys marsh rabbit (Sylvilagus palustris hefneri) lives in coastal prairies and freshwater marshes of the lower Keys. These habitats are rapidly disappearing due to development in the lower keys, placing this endangered species under the threat of extinction. Tropical hardwood hammocks provide critical habitat for the Key Largo woodrat (Neotoma floridana smalli) and the Key Largo cotton mouse (Peromyscus gossypinus allapaticola). Both species originally ranged throughout Key Largo, however as a result of habitat destruction they are currently limited to the northern third of the island and listed as endangered species. 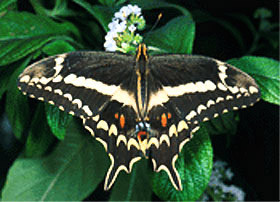 The endangered Schaus swallowtail butterfly (Papilio aristodemus ponceanus) is also dependent upon hardwood hammocks. This species is on the decline due to habitat destruction as well as insecticide use and extreme weather conditions. Marine and estuarine habitats surrounding the Keys provide habitat for threatened and endangered species. 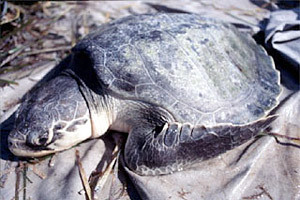 The Florida population of green sea turtles (Chelonia mydas) has been considered endangered since 1978. The declining population has been victim to commercial harvesting for eggs and food as well as incidental by-catch in the shrimp fishery. Hawksbill sea turtle (Eretmochelys imbricata), Atlantic Ridley sea turtle (Lepidochelys kempii), and leatherback sea turtle (Dermochelys coriacea) are all listed as endangered species while the loggerhead sea turtle (Caretta caretta) is considered threatened under the protection of the ESA. Recovery plans have been established for all listed sea turtle species. The manatee (Trichechus manatus) is another endangered aquatic animal observed from time to time in the waters surrounding the Keys. 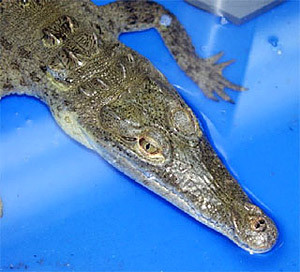 American alligator (Alligator mississippiensis) is protected due to its similarity in appearance to the threatened American crocodile (Crocodylus acutus). 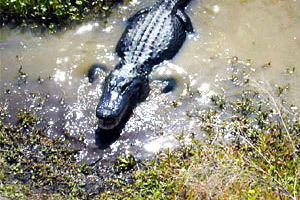 In Florida, alligators are widespread and are residents of Biscayne National Park in the Keys. There are many other threatened and endangered species in the Florida Keys including the Stock Island tree snail (Orthalicus rees), southern bald eagle (Haliaeetus leucocephalus), and roseate tern (Sterna dougalli). For more information on threatened and endangered species, visit the Florida Fish and Wildlife Commission’s List of Florida’s Imperiled Species.